It's not all about WhatsApp you know, there are tons of instant messengers out there. We’ve rounded up ten of best the Android platform has to offer, along with screenshots and feature lists so you can best choose which one suits your individual tastes and needs. 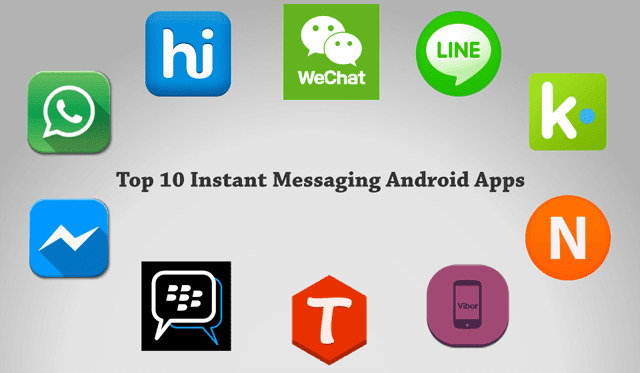 Here are the best instant messenger apps for Android. Facebook’s official instant messaging app has recently been made over to deliver a faster, cleaner service and interface. It’s much like WhatsApp (as are most of the apps on this list), but Messenger instantly connects to all of your Facebook contacts, making it one of the most convenient messaging apps if nothing else. As of recently, however, you can also message non-Facebook friends by using their phone number. 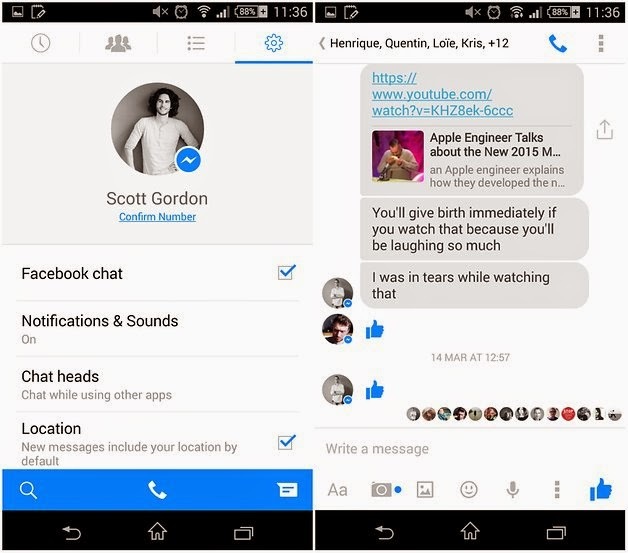 Messenger allows you to access all of your Facebook messages without using the main app or website. It’s also got stickers and emojis, groups, voice recordings, location data, free calls, photo sharing and more. The granddaddy of video calls, Skype has been around for forever and is still kicking strong. Skype is primarily used for calls, but the IM component is just as useful. In fact we use it at Android as our primary communication tool. 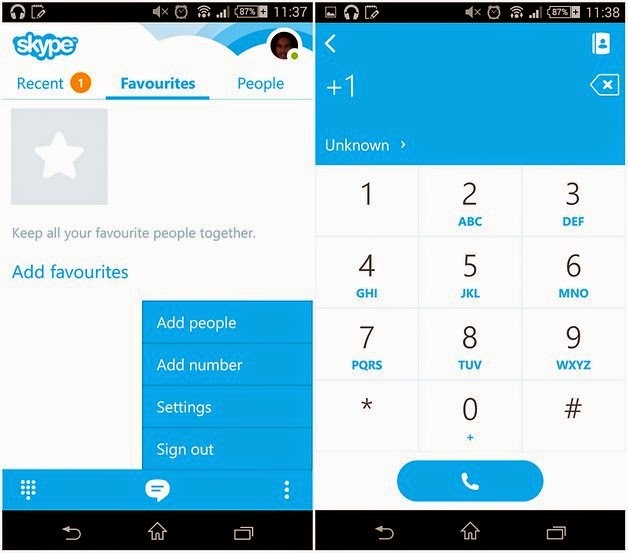 Skype requires Skype ID’s though, so you’ll only be able to add friends if you know their Skype contact name. But once you do, and basically everyone is on Skype too, you can have video chats anytime you want, for free. You can also add Skype credit and make cheap international calls to landlines and mobile phones. 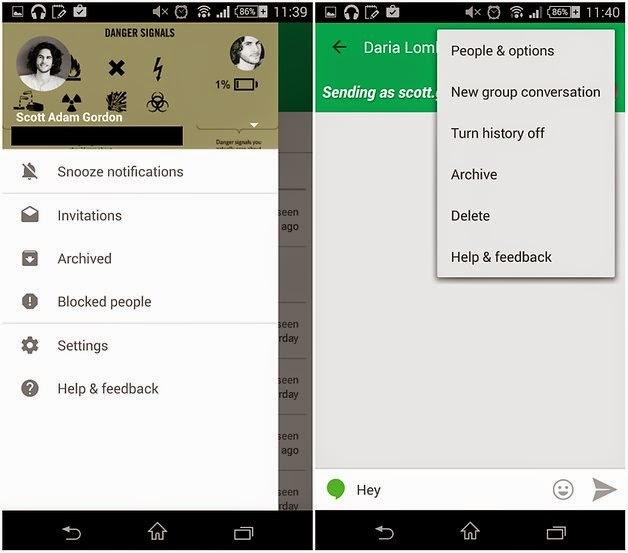 The chat section offers group chat, media sharing, emojis and more. Plus you can have one account on several devices (something which WhatsApp doesn’t allow offer). Google set up Hangouts as the standard (but interchangeable) messaging app in Android 4.4 KitKat, and thanks to this it picked up a lot more users. Hangouts is a combined SMS and IM app, that separates the two types of messages, but can be used to automatically place voice calls and video calls from your phone via Hangouts rather than traditional carriers. Because it handles both SMS and IM, it cuts down on the number of apps you need to be working with, and its video calling quality is arguably better than Skype's. In addition, Hangouts integrates with Google+ in much the same way that Facebook Messenger interacts with Facebook, meaning contacts added via the social network can be called/messaged in the separate app. Be careful who you connect with if you're a particularly private person. Viber is really pushing the sticker market, where you can get tons of free and paid sticker packs, but the core business of Viber is instant messages. You can, of course, also send recorded voice messages like WhatsApp (but not video calls like Skype) and you now have the option to call any phone number anywhere with Viber Out – much like adding Skype credit to call people not on the service. 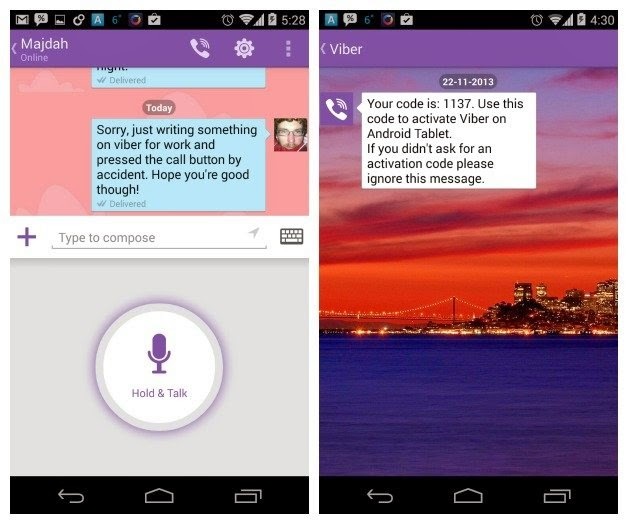 Check out my tips and tricks for Viber article for more info. Line is becoming more and more popular, and for good reason. With the recently added video calling functionality, it is now as fully featured as Skype, but has a younger, sexier feel to it than the tried and true Skype. It’s jam packed full of stickers and other fun stuff, and is immensely popular throughout large parts of Asia. But it’s also feature filled with group chats, multi-platform capabilities (phone, tablet, PC), timeline, recorded voice messages, media sharing and much, much more, including official account messages from celebrities you like. 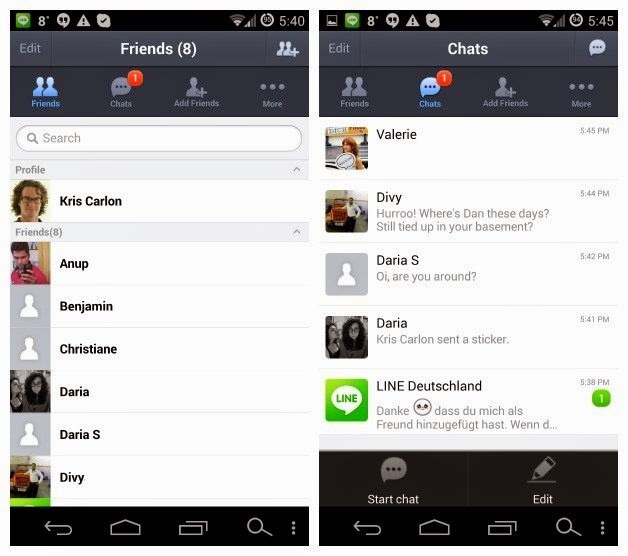 Line is kind of like Twitter, Facebook and Skype all rolled into one. 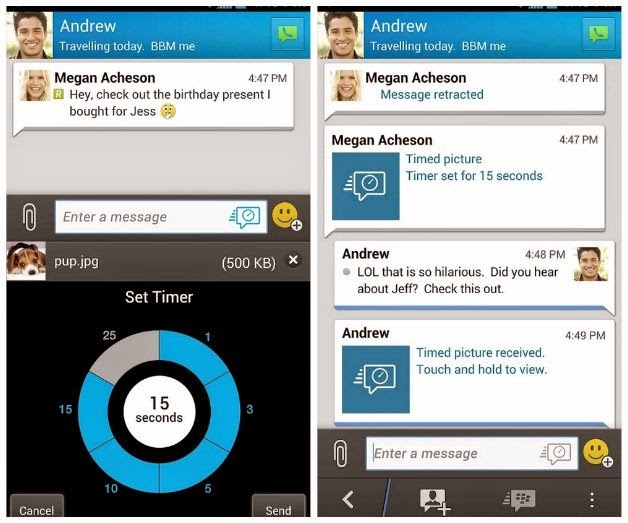 After a substantial waiting period, BlackBerry's messaging service finally made it to the Android platform last year. BBM is not as Android as the rest of the apps on this list, but it does offer some very cool features including: always-on service (you don’t need to open the app to use it), timed and retractable messages, 2-way opt-in (nobody can message you until you specifically allow them), delivery reporting, groups, emoticons, broadcast messages and more. The ability to choose who can message you, rather than it being available to anybody with your number, makes this an attractive messaging option.